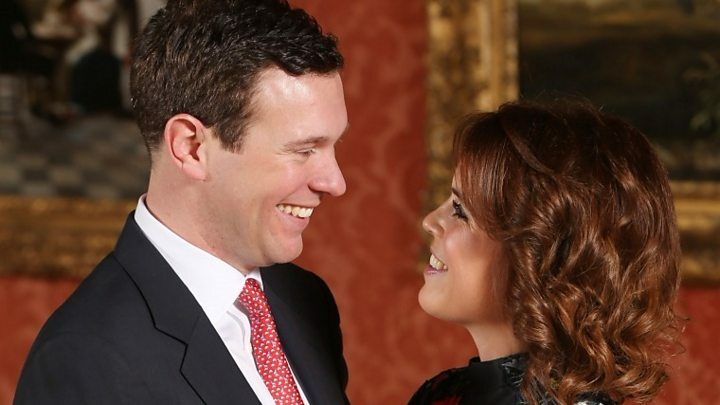 Princess Eugenie has described the proposal from her long-term boyfriend Jack Brooksbank as a "perfect moment". The Queen's granddaughter said it was a "complete surprise" when Mr Brooksbank got down on one knee in front of a volcano as the sun was setting in Nicaragua earlier this month. The princess told BBC's The One Show that she cried and was "over the moon". The wedding will take place at St George's Chapel, Windsor Castle, in the autumn. It will be the second royal wedding at the chapel this year - Prince Harry and Meghan Markle are due to marry there in May. Princess Eugenie said the couple were looking over a lake while the sun was setting before the proposal. She said: "The lake was so beautiful. The light was just a special light I had never seen. I actually said this is an incredible moment, and then he popped the question, which was really surprising even though we have been together seven years. "I was over the moon. "[It was a] complete surprise. But it was the perfect moment, we couldn't be happier." Mr Brooksbank said: "It was amazing." The princess met the former manager of Mayfair club Mahiki on a skiing trip. "We met when I was 20 and Jack was 24 and fell in love," she said. "We have the same passions and drive for life." Mr Brooksbank said it was "love at first sight". "I love Eugenie so much and we are just so happy and over the moon for what is to come," he said. The princess added: "Granny actually knew right at the beginning [of the engagement]. She was very happy as was my grandfather." Engagement pictures of the couple, taken in the Picture Gallery at Buckingham Palace, were released following the announcement. In the photographs, Princess Eugenie is wearing a dress by Erdem, shoes by Jimmy Choo and a ring containing a padparadscha sapphire surrounded by diamonds. Mr Brooksbank said: "I found a ring in a jewellers and then proposed to Eugenie without it and came back and we designed the diamonds around this padparadscha sapphire. "And what's amazing about it is that it changes colour from every different angle that you look at it, which is what I think of Eugenie. "That she changes colour and is just so amazing." The padparadscha is a rare pink-orange sapphire and is usually found in Sri Lanka. The Natural Sapphire company said the gem was named after the colour of a lotus blossom. Princess Eugenie's ring is similar in shape and design to her mother's engagement ring, which had a red ruby as the central stone. Twenty-seven-year-old Eugenie is the second daughter of Prince Andrew and Sarah, Duchess of York, and is eighth in line to the throne. She will keep her royal title when she marries Mr Brooksbank and will have the option to take his surname. The princess works in the arts as a director at gallery Hauser and Wirth. In a series of tweets, Sarah Ferguson congratulated her daughter and her fiancé, calling the announcement "Total joy! ".